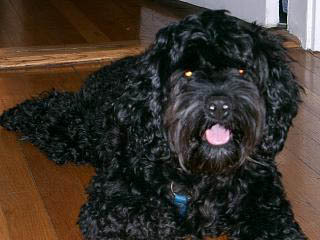 We wanted to update you on Toby (formerly Mojo) adopted in August of 2003. We LOVE Toby so much!! He is the best dog in the world -- rivaled only by his new brother, Beardsley. 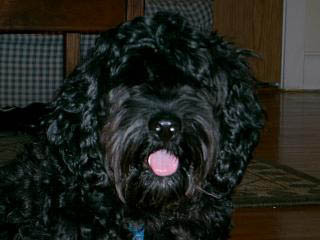 We adopted Beardsley in March of 2006. Beardsley was a heartworm positive schnauzer/collie/lab/???? mix from Arkansas -- his owners moved and left him to wander the streets. Toby (25 lbs) was none too happy to have Beardsley (58 lbs) enter his home at first. But they are now best friends and our little pack is complete. Toby and Beardsley spend their days together sleeping, playing tug-of-war (Toby always wins) and watching things out the window. They love to go on runs and walks, and get attention everywhere they go. They both have yet to meet someone they don't like. Thanks again for saving our Toby and allowing us to adopt him. After seeing our success with adopting him, no fewer than 7 family members and friends have adopted dogs, and we have become very active in rescue ourselves. He is a little ambassador for rescue. Keep up the great work! PS -- I've attached a picture Beardsley and Toby after they destroyed a foam pillow with TINY little foam pieces. Our home looked like a snowglobe! I'll send some better pictures soon. 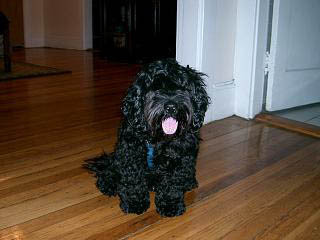 I just wanted to send you an update on our puppy, Toby (formerly Mojo), who we adopted in August of 2003. He is the best dog in the world - we could not be happier! He has added immeasurably to our lives, and we tell everyone we can about Save-a-Dog. At our recent wedding in July of 2004, we put a little picture of Toby and information about Save-a-Dog at every place setting. We also told everyone that instead of standard favors, we made a donation to Save-a-Dog - our guests loved it. 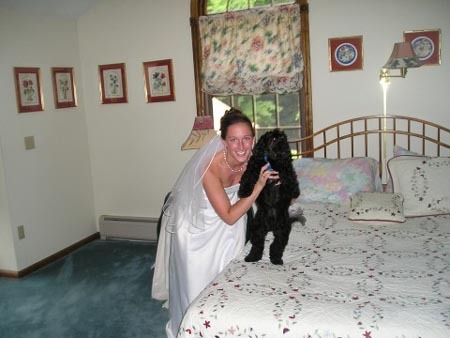 I have attached a picture of Toby on our wedding day. Keep up the good work - your organization is wonderful, and you have made so many people (and dogs) so happy. We owe you more than you know. We wanted to write and update you on our puppy, Toby (formerly Mojo). We adopted him in August of 2003, and he is absolutely the best dog in the world – we are just so in love with him. People stop us on the street to comment on how cute he is, and his sweet personality has won over all of our friends, including the ones who had previously been nervous around dogs. He is the master of playing fetch, but at the same time, is a cuddle bug – he will sit on our laps for hours on end. He wakes us up every morning by jumping on our faces and licking our noses until we have to get up. We want to thank you (and Leah, his foster-mom) so much for giving us a chance. We are a young couple (both 25), and he has been the joy of our lives. He sleeps with us every night, comes to work every once in a while with me (I work in a nursing home, where the residents just love him), and constantly makes us smile and laugh. He has really made us a “family.” We are hoping to train him to be a certified “therapy dog” so that he can join the pet therapy program at my work. Toby is the happiest dog we have ever met, and has made us happier than we could have imagined. We are getting married in July, and instead of traditional favors, intend to make a donation on behalf of our guests to Save-a-Dog and everyone at the wedding will get a picture of Toby on their dinner plate!